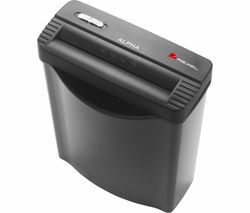 Improve your security with a paper shredder and you won’t have to worry about your personal information getting into the wrong hands. Online identity theft may be on the rise, but the majority of identity thieves retrieve your information the old fashioned way – through personal documents that are discarded. The Home Office recommends that shred everything containing your personal information, including bank statements, credit card bills, unwanted post, old credit cards and, in some cases, CDs. Our extensive, affordable home and office shredder range is capable of all that, helping you shred unwanted paperwork and plastic in no time. A strip cut shredder cuts in one direction, cross-cut shreds in two directions for medium security, and for high security there’s micro cut, which shreds paper into the smallest pieces. We have a range of shredder sizes to choose from too, from neat and compact 7.5 litres to large 32 litre models that are perfect for offices and high volume shredding. Get the task done more quickly with shredders that can shred up to 11 sheets at once, as well as cutting through credit cards, CDs, paperclips and staples. 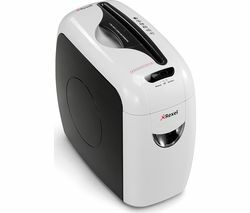 For home or the office, get rid of unnecessary paperwork safely and easily with a paper shredder. See our full range of office supplies and equipment for a selection of shredder accessories too, including oil sheets to keep your blades in top shape.